The lights along the Rue Notre-Dame in Old Quebec create a golden glow to the area as the lights from the hotel known as the Fairmont Le Chateau Frontenac stand high on the hill in the backdrop. As you look up at the hotel from the streets below in Quebec City, it almost appears as though you are looking upon a royal palace. Fairmont Le Chateau Frontenac seen at blue hour from along Rue Notre-Dame in Old Quebec, Quebec City, Quebec, Canada. UNESCO World Heritage Site. 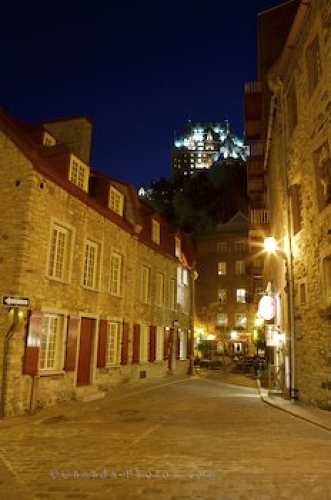 Picture of the golden shaded streets in Quebec City as the lights of the hotel tower above.